KOKOMO, Ind. – After a 2013 campaign that saw the Indiana University Kokomo women’s volleyball team turn in a 28-11 season, the hype for the 2014 season was very high during the preseason – including a No. 3 ranking in the Kentucky Intercollegiate Athletic Conference poll. Unfortunately, on opening night at Cougar Gym, the Cougars showed they are still a young and maturing program in a 25-22, 25-22, 25-23 loss to Judson University from Elgin, Ill. Despite the loss, the Cougars never trailed by more than five points all night. After falling behind 13-8 in game one, the team showed spark by tying the contest at 14-14 and 15-15, both times on kills from freshman Lindi Thomas (Parker City, Ind./Wapahani). An error by Judson gave Kokomo its first lead of the new season at 16-15 and a powerful kill from freshman Elyse Younger (Fishers, Ind./Fishers) gave the Cougars its biggest lead of the night at 22-19. But a net serve and three straight errors spelled doom for Kokomo as they fell 25-22. The second game was much the same, but Kokomo (0-1) could never grab the lead despite seven ties in a 25-22 loss. The Cougars started strong in game three, grabbing a 3-1 lead on a kill from Younger and a Judson error. But that would be the last lead of the night. Kokomo closed to 18-17 on another nice play from Thomas, and again at 24-23 thanks to a Micayla Speidel (Columbus, Ind./Columbus East) kill on a set from Cortney Hanson (Logansport, Ind./Pioneer). 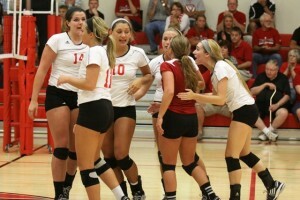 But an unforced error by Kokomo ended the contest with a straight set win for Judson (1-0). Lael Larrick (Denver, Ind./North Miami), Kokomo’s lone senior, led the Cougars with a team-high 15 digs while Thomas had a team-high 16 kills to go along with 10 digs. Hanson led the squad with 25 assists, Speidel had 11 kills, Younger had seven kills, Kaleigh Ensley (Fort Wayne, Ind./Snider) had 11 digs and a pair of aces and Rachel Allen (Lizton, Ind./Tri-West) ended with six digs. As a team, the Cougars had 39 kills, 46 digs and five blocks. IU Kokomo is back in action on Aug. 22 at the Grace College Invite. They return to Cougar Gym on Aug. 29 in a 7 p.m. matchup with Goshen College.